Before there was the DC Cinematic Universe, before there was the Marvel Cinematic Universe, there was the DC Animated Universe. This term is still used sometimes to refer to the constellation of animated features and shows that Warner Bros. puts out using DC characters, but most of those are in their own little pocket dimensions of continuity, a few consecutive adaptations of Jeph Loeb’s Batman/Superman comics notwithstanding. The DC Animated Universe proper started with the Batman cartoon launched off the popularity of the Tim Burton film and grew and evolved through the related Superman series and reached its apotheosis in the animated Justice League series. There were a couple spin-offs/tie-ins set in a future timeline, too. Justice League Unlimited, the final incarnation of the Justice League show, was also the final on-screen incarnation of the DCAU. It didn’t have to be. Warner launched unrelaed cartoons based on the young hero properties Teen Titans and the Legion of Superheroes that were both originally at least briefly developed as spin-offs from the Justice League, set in the same continuity. The Legion show was even launched by a backdoor pilot that had the Justice League Unlimited version of Supergirl going off into the future with the DCAU version of the Legion… only for the actual show to be a separate continuity, featuring Superboy. It would be a mistake to attribute any one single factor to these decisions, or to the general decision to pull the plug on a surprisingly coherent and much-loved multimedia franchise, but one thing that was almost certainly a factor is the parent company’s paradoxical fear that the sub-franchise was getting too popular. A generation of fans had literally grown up with these versions of the characters. Changes made for the TV show were familiar to more people than the original versions. There was a danger they would come to be seen as the “real” version of DC characters, which would be bad news if the company ever, say, tried to reinvent them as movie characters. If every DC animated property were clearly its own little thing in its own little walled garden, on the other hand, no one would ever see it as more than an adaptation or a spin-off. Not to put too fine a point on it, but I think this kind of thinking is backwards and wrong-headed. The DC Animated Universe was successful because it was good. It resounded and endured because it worked. If DC Comics wants to reboot their universe back to an “iconic” version (as they so often seem to want to), they really should be looking at the DC Animated Universe as their model. It took what was great and familiar about the comic book universe and magnified it, while fixing or cleaning up or reinventing other areas. The DC Animated Universe gave us the character of Renee Montoya because one episode of Batman needed there to be third cop to provide a different point of view than the established ones for a Rashomon-like take on the dark knight. She was popular enough to migrate over to the comics, and even became a legacy costumed hero when she inherited the mantle of the Question. It also gave us Harley Quinn, Lex Luthor’s ultracompetent valet/henchperson Mercy Graves, Superman villain Livewire… notice how these new characters are female? Moving to a new medium and trying to capture a new audience gave the people calling the creative shots both the need and the freedom to invent characters that made the genre more diverse. Freeze insisted he was one of the greatest of Batman’s foes, but lamented that no one had ever explored his heart. He was sure he was ripe for a comeback, though, just as soon as someone represented the great tragic potential he represented. I didn’t read the story when it was new. When I saw it in a compilation, it was a surprisingly effective punch in the gut. Did Morrison predict Freeze’s revival? Did he cause it? However it happened, it happened, and the DCAU took a forgotten, one-note theme villain and reinvented him as a truly unforgettable character. As the grim and gritty (or maybe I should say stark and schlocky) cinematic universe DC Comics is allowing Zack Snyder to weld together continues to be a screeching trainwreck, I find myself looking back at the animated universe that was all the more fondly for all the things they got right, for portraying superheroes as human beings (or people, in the case of the ones that weren’t human), for recognizing that comic book action adventure doesn’t have to give up its sense of fun to also be moving, and for the strides it took towards representation. With that in mind, I’m going to share some of my favorite moments from the DC Animated Universe, all of which are basically just moments. Not big fight scenes, not giant set pieces, just moments… moments that are rooted in great characters, and from which great characterization can bloom. 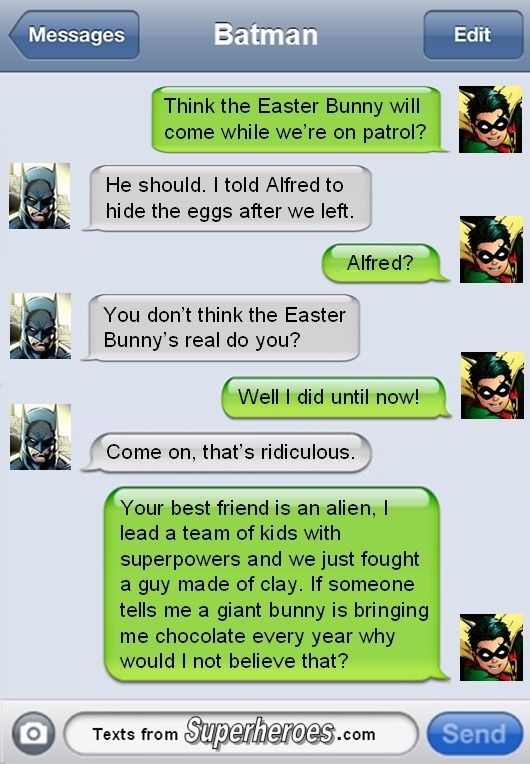 The web feature “Texts From Superheroes” is hilarious in large part because the people who make it really get comics and the characters involved. Even when they’re making fun of comic book logic, it’s clear they’re coming at it from a place of understanding. It’s one of my favorite ones because it reminds me of an actual Justice League comic book, where Batman discovers an invasion plan by “white martians” by following reported ghost sightings. He explains to his sidekick of the moment (let’s say it was Nightwing) that he knew it had to be white martians because “there’s no such thing as ghosts.” The sidekick responds by listing off all the ghosts that they know personally. I love moments like this. I love Batman the kneejerk skeptic who is sure that the ghost sightings must be phony but can wrap his head around invisible, shapeshifting, telepathic aliens because that’s just superpowers and anyone can have superpowers. I love the gradual evolution in that era of comics from Batman not believing in magic to just hating it to grudgingly deploying it for his own benefit. All that said, that’s not the DCAU, and the moment I want to highlight isn’t about Batman, but about Superman. Batman doesn’t believe in ghosts even though he’s met ghosts. But Superman? Superman still believes in Santa Claus, even though he personally has a secret hideout at the North Pole. You can also read it as Clark insisting on keeping up the pretense for the benefit of J’onn, but let’s face it: that’s less fun. “Comfort and Joy”, the first and only Justice League Christmas special, is the only episode in the original run of the show that isn’t a multi-parter. Cartoon Network even aired the run first of the series in back-to-back blocks, making each pair of episodes a single hour-long story the same as any TV drama. It was an amazing era of animated comic book-style storytelling that I don’t think had any real precedent in western animation and that I don’t think has been replicated since. But a planned three part series finale left them with an extra episode in the production schedule, and rather than trying to cram the kinds of stories they’d been doing in ~40 minutes into ~20 minutes, the creative crew decided to give us a look at the team’s downtime around the holidays. Even with a short episode weaving together multiple subplots for the members of the team, it still came off as a surprisingly intimate look at the characters we’d been following for so long. This quiet moment, among many other similar moments, always stands out as both being a bit like a self-aware parody but also a perfect character beat. This one requires a bit of set-up, though not much: in the episode “The Great Brain Robbery”, Lex Luthor is in the body of the Flash, and vice-versa, because of stuff. It’s another one that could have been ripped from a Text From Superheroes scenario (imagine sending the wrong person a selfie), but which works as a perfect character beat. Written funny, acted just right, executed perfectly. It’s a marvel of comic timing. For an added meta level, Michael Rosenbaum (here voicing The Flash) played Lex Luthor on Smallville. From the same episode, a counterpoint scene with the Flash in Luthor’s body, in the men’s room of Luthor’s evil hideout, where he executes the perfect imitation of a depraved criminal mastermind. I love when actors play each other, and Clancy Brown does a pretty good imitation of the delivery style of Michael Rosenbaum. The way Flash thinks Luthor would behave here reminds me of a beat from the first episode of the second season of the current live-action Flash, where Barry Allen is in an elaborate fantasy sequence where all the stuff that went wrong… didn’t. 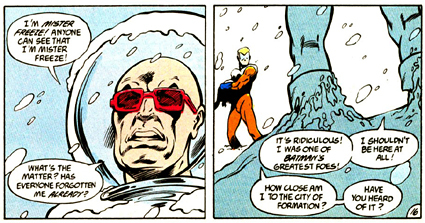 One of the things that tips the viewer off is that Captain Cold, the smarmy, sly supervillain played with panache by Wentworth Miller, is shouting somethign like “I’M GOING TO KILL YOU, FLASH!” with a tone of voice and style of delivery that seems borrowed from Snake the career criminal on The Simpsons. This is a character who always keeps his cool, and not entirely (though mostly) because that fits his villain theme. The CW’s take on Captain Cold is so dedicated to the gentle art of theme-villainy that he still makes the requisite cold puns even when he’s lost his empowering technology and is just a guy punching other guys. He doesn’t even stop to get a real gun to replace his cold gun because he can’t figure out how to keep the ice bullets from melting. And when the Flash tries to imagine a fight with him, he winds up yelling “I’M GOING TO KILL YOU, FLASH!”, which is exactly what a little kid playing with action figures would make the Captain Cold one yell. So. If you haven’t read many comics, you still know about Thor. The comic book character of Thor and all the associated comic book mythology is really the result of Jack Kirby really being enthralled with the Venn diagram between “gods” and “superheroes”. It’s not just “What if gods are just sufficiently advanced aliens and magic is just sufficiently advanced technology?” And it’s not just “What if characters like Superman and Wonder Woman are the modern-day heroes of legend and gods?” It’s both of those things crammed together, with focus on a sort of interstitial creation space where both things can be true: Thor is both a god and an alien superbeing. Mjolnir is both magic and technology, and not like some funky Final Fantasy magitek sort of way. It’s the kind of creative exercise that wouldn’t really become “hip” until the 90s, and a lot of people don’t really realize that Kirby was doing it, at first with the Asgardians and others at Marvel and then with his “New Gods” for DC Comics. So many people on both sides of the page try to parse them wholly as divine beings or superheroic ones, and historically the interpretation has fallen on the side of the line that was less likely to lead to moral panic and calls for boycotts: so the New Gods have superpowers, they wear capes and tights, they hang out with Jimmy Olsen, and apart from calling themselves “gods” they don’t really do anything terribly god-like in most of their appearances. And then we come to Darkseid, the main evil New God, and his first meeting with Superman in the DCAU canon. That is the first time Darkseid ever registered to me as being more like a god than a generic world-conquering megalomaniac supervillain. No amount of shouting “YOU DARE CHALLENGE A GOD?” makes someone come off god-like. In fact, there’s a real danger that doing so just emphasizes how much like a god you’re not. As the male version of Ghostbusters pointed out years ago, it doesn’t take any special kind of credentials to say that you’re a god. But by the same token that anyone can do it, it doesn’t exactly prove anything. Darkseid’s retort to Superman is a Biblical powerplay. You don’t tell people that you are God. You simply assert that you are. You are power. You’re majesty. You’re beauty, you’re grace, you’re Miss Outer Space. Darkseid never worked for me as a character before this moment. He’s rarely worked so well since then, but this one scene earned him a lot of goodwill. As establishing character beats go, it’s a doozy. The Justice League cartoon’s version of Green Arrow is not my favorite version of the character. He’s kind of been de-clawed by turning the liberal sensibilities of the comic book version into a sort of populist skepticism about “Big Justice” or the superhero-industrial complex. He was also introduced in the Justice League Unlimited era of the show, when the hour-long stories about a tight-knit ensemble of seven superheroes was replaced with shallower half-hour stories about an ever-shifting and expanding cast of characters. I’m not saying I didn’t like the JLU version of the show; on the contrary, I think its expansive view of the past, future, and present of the DC Universe at large helps cement the DCAU as a definitive vision for the property. It did things the previous incarnation of the show couldn’t. But at the same time, no “Unlimited” character got quite the same deep, thoughtful treatment as the original line-up did. You don’t have to really know what’s happening there beyond the obvious: yes, it’s a submarine stealing a frozen viking ship. And yes, that’s Green Arrow humming along to his own theme music. That is his personal action theme, not the show’s general background music. It’s the song that specifically plays when Arrow is launching himself into danger. And he’s humming along to it. Now, this is not a fourth-wall-breaking show, and he’s not a character who is prone to moments of meta-awareness in the way, say, the Joker or Deadpool might be. So what we have to take away from this isn’t that he is actually aware there is a theme song playing. What we have to take away from this is that Green Arrow is the kind of man who imagines exciting instrumental music playing whenever he’s doing something that strikes him as particularly badass, and the kind of music he imagines is exactly the kind of music the people making this cartoon came up for him. It’s this moment of winking at the audience that lets us know that the JLU crew knows Ollie is a theatrical blowhard, and that’s how the character works best. For instance, there was the time when Flash apparently ran away from a super-super-powered version of Lex Luthor only to run all the way around the world to suckerpunch him at near-light speeds. Again. And again. And again, almost dying in the process himself. That’s a good one, but understanding what’s happening and why would take a lot of getting there. So let’s just jump to this one, from the end of the last season of the last show in the DC Animated Universe. First of all, notice how much less imposing and inspiring Darkseid is when he’s growling about how he’s a god than he was in their first meeting. But enough about him. There’s some good stuff about Batman in there as an aside, but let’s talk about Superman. One of the things that the DC Animated Universe did right was making Superman a bit less powerful. This made it easier for the writers to provide him with challenges and for the rest of the team (who were also de-powered to varying to degrees) to shine. He lost a lot of his ancillary powers. He was almost impossible to injure, but he felt a lot more pain than most versions of the characters. He was never quite as strong or as fast as long-time fans expected him to be. And here, we find out that this whole time, he’s been holding back. Just a bit. And even though he’s Superman, even though he represents the best of us, even though he still believes in Santa: he finds it frustrating. He wants to cut loose. And in the last big fight scene of the last episode of the last show in the DCAU, he gets to. Alexandra Erin is a crowdfunded author, commentator, and poet. If you enjoyed this, please tip accordingly.